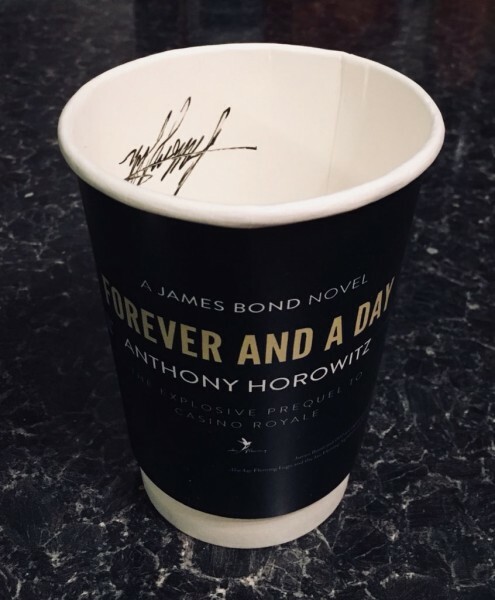 I enjoyed Trigger Mortis, Anthony Horowitz’s 2015 James Bond novel, a great deal, so I’ve been excited for ages about the release of his second, Forever And A Day, on May 31st. Last night I went to see him talk about it at the Royal Festival Hall. There’s been more publicity than I remember from previous Bond continuations, or maybe I’ve been more tuned in to what was going on: an ad on the huge display screen at Waterloo, and a roulette wheel in Waterstones Piccadilly where you can win fabulous prizes (or, in my case, a consolation travelcard holder). Waterstones even had branded takeaway cups in their cafe, forcing me (forcing me I tell you!) to have a latte. I met up with an internet friend from the spy fiction circuit and we had an enjoyably geeky conversation across many fictional universes while we awaited admission. The talk was a real pleasure. Anthony Horowitz is a lifelong Bond (and Sherlock Holmes, and Tintin) fan who admitted to wanting the continuation gig for years before finally getting the call, and his aim in writing Bond is to entice new readers towards Ian Fleming’s books. What a lovely speaker and person he is - warm, witty, clever and enthusiastic. I'd expect no less from a Tintin fan. I especially liked the way he involved the two sign language interpreters, who were taking turns and doing a really good job (seeing one of them sign 'the bit in The Spy Who Loved Me where the parachute opens and it's a Union Jack' was a highlight of the evening). I even managed to put my hand up and ask a question, which I'm usually too shy to do. It was "Who do you picture when you're writing Bond?" and the answer was "Sean Connery, because of the age I am." There was a long queue for the signing afterwards, but everyone got a nice conversation at the signing table. I told him that (1) I like Trigger Mortis more than I like Kingsley Amis’s Colonel Sun (2) the first Bond novel I read was the same as his: Dr No in the film tie-in cover, and I think he appreciated both these facts. He not only signed three hardbacks (two for me and one for a friend), but my Waterstones coffee cup (I asked them for an extra, explaining that otherwise I would have to keep an unhygienic coffee-stained one in my home forever). I managed to find a few more online pals and we enjoyed a drink and some Bond chat (I ended up enthusing about the hovercraft museum for perhaps longer than necessary) before heading out into the humid London night. Signing the inside of a coffee cup takes some skill! I presume the signature is necessarily upside-down from the perspective shown in your picture, because of how he would have had to get his hand in? Yes - I suggested he go round the bottom of the outside, but I guess he wanted a bigger canvas!